« How are music services responding to Apple’s new TOS? Last month we saw how Amazon had to change its Kindle iOS app to comply with Apple’s TOS. Amazon eliminated the ‘Kindle Store’ button making it harder for Kindle readers to purchase books. Today, Amazon has fought back by releasing the Amazon Kindle Cloud Reader – A pure HTML5 web application for reading books. 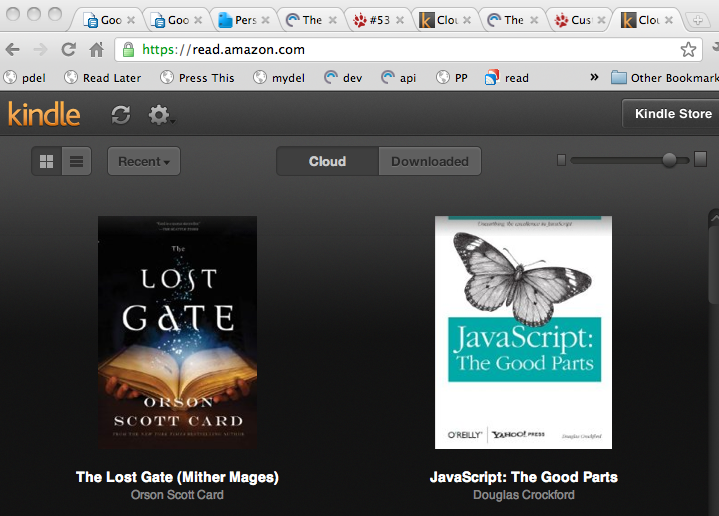 The cloud reader lets you do anything that the native Kindle app does, including offline reading. And, since HTML5 apps are not subject to Apple’s TOS, the Kindle Cloud Reader brings back integration with the Kinde Store. This may ultimately become the most viable route for music subscription services as well. Instead of creating native iOS apps, music services may look to create rich web apps instead. HTML5 is certainly capable enough, and soon audio support and local caching will be mature enough to support even the most sophisticated music listening app. MOG has already converted their main application to HTML5. I suspect more will follow suit. As HTML5 improves, we may see an exodus away from iOS. The more you tighten your grip, Apple, the more applications will slip through your fingers. This entry was posted on August 10, 2011, 7:54 am and is filed under Music. You can follow any responses to this entry through RSS 2.0. Both comments and pings are currently closed. I had no idea that Card had started a new series until I saw this post. Thanks.